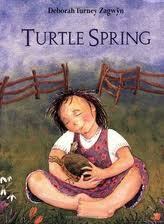 When Clee’s new baby brother is born, her uncle brings her a pet turtle as a surprise. When winter comes, Clee is sad to find her turtle cold and still, and she buries him in the compost heap. But when spring arrives, with it comes a happy surprise! This book introduces the concept of hibernation, as well as sharing the growing bond between two siblings.